Hey Google, whatever happened to Ask Jeeves, Dogpile and AltaVista? Buffy the Vampire Slayer was the first show on American television to use the word "Google" as a transitive verb. It was 2002, in the fourth episode of the show's seventh and final season. Buffy, Willow, Xander and the gang are trying to help Cassie, a high school student who cryptically says she's going to die next week. In Buffy's dining room, they search through hard copies of Cassie's medical records and find nothing noteworthy. Willow, tapping away on a thick white iBook, turns to Buffy and asks, "Have you Googled her yet?" Xander replies, jokingly, "Willow, she's 17." "It's a search engine," Willow explains, because that's something that had to be done in 2002. Google was established in 1998, and within just four years it debuted as a new and innovative tool on prime-time US television. It took just eight years for Google Search to become so ubiquitous in Western society that Merriam-Webster and the Oxford English dictionaries officially added it to their rosters as a transitive verb, capitalized or lowercase. Today, the phrase "Google it" has dethroned any variation of "do an online search," and jokes about misinterpreting the root word fell out of vogue years ago (along with Xander's haircut). Google is the default search engine, homepage and online landing pad for people around the globe, ranked as the No. 1 site in the world by analytics company Alexa. Google is so ingrained in online culture that it feels as if it's always been there. As if, when Tim Berners-Lee booted up the web's first page in 1991, he typed the URL into a Google-branded search bar. In the late '90s, dozens of online search engines were vying for attention, offering cute mascots, clever branding and technically distinct solutions for navigating the World Wide Web. Google the search engine went live in September 1997, one year before Larry Page and Sergey Brin founded Google the company, and it quickly took hold. Their advantage was a patented algorithm called PageRank, which sorted websites by relevance, or the number of times they were cited by other pages. Most other search engines found results based on keyword density, but Brin and Page's method focused on the human input nestled between websites. Google quickly devoured the competition. PageRank has remained the backbone of Google Search for 20 years, as the internet has grown into a pervasive and necessary tool for modern existence. And as the internet has expanded, so has Google. It isn't just the world's No. 1 website -- it's the heart of a publicly traded, for-profit conglomerate worth hundreds of billions of dollars. Google holds humanity's knowledge in its search bar, and it has the ability to shape conversations on a massive scale. Imagine the internet as a million-volume collection of books, each one densely packed with essential information (and cat pictures). Google represents just one book in this series, offering up only the information that its authors -- i.e., algorithms -- deem worthy. Given Google's dominance as a search engine, everyone around the world is reading the same book, while 999,999 other stories collect dust on the shelves. For example, search for the word 'man,' and you get images almost entirely of white men, albeit of varying ages. A search for the word 'woman' also reveals an overwhelming majority of young, white women. Considering that the majority of the global population is non-white, we do immediately see how white, western-centric biases -- from race and gender beliefs to cultural standards of beauty and value -- dominate the very way the web works and what stories it tells about humanity. Google is the Westernized, for-profit steward of our ever-expanding digital reality, but it wasn't always so. Back in the late '90s, Google Search was competing with a handful of other engines, most of which have faded into the ether by now. Here's a look back at three search engines that Google gobbled up nearly 20 years ago. Ask Jeeves was a character-driven search engine, if ever there was one. Founded in 1996, Ask Jeeves featured a well-dressed valet who supposedly fetched search results and was able to understand questions posed in everyday phrasing. Natural language processing is still tricky for developers today -- just ask Siri anything -- so this was a daunting pre-Y2K goal. Ask Jeeves lasted until roughly 2005, when it was rebranded as Ask.com. The company attempted to invade Yahoo Answers' territory by focusing on a real-person Q&A site, but Ask.com ended its foray into search engineering in 2010. Ask.com is ranked No. 128 in the world, according to Alexa. "The results from this latest study highlight the fact there are vast differences between the four most popular single search engines. The overlap across the first page of search results from all four of these search engines was found to be only a staggering 0.6 percent on average for a given query." 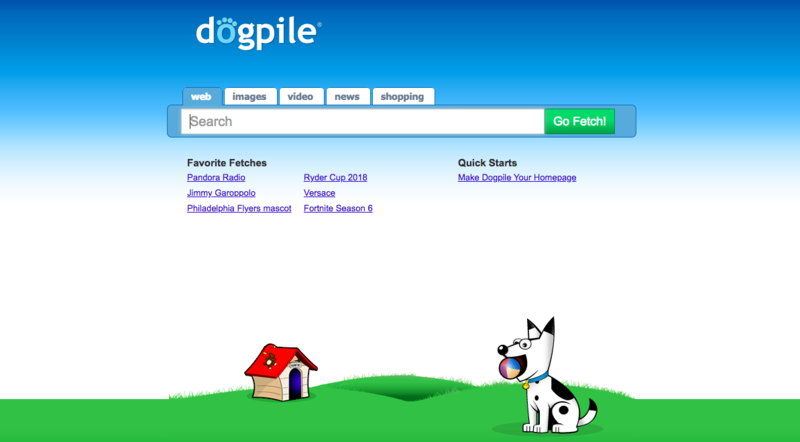 Dogpile is technically still live, though it looks like something out of the early 2000s. That was its heyday -- Dogpile won the award for Residential Online Search Engine Service from JD Power & Associates in 2006 and 2007. Dogpile is ranked No. 8,175 in the world, according to Alexa. AltaVista was the site best-situated to actually take on Google. Founded in 1995, AltaVista came from researchers in the labs of Digital Equipment Corp. and featured a fast and expansive crawler plus an advanced back-end search system capable of handling more than 10 million queries a day. By 1997, AltaVista was the most popular search engine around, bringing in millions in revenue and becoming the exclusive backbone of Yahoo search results. The site was hit hard when the dot-com bubble burst in the early 2000s. AltaVista changed hands a few times but ended up in Yahoo's portfolio in 2003. Yahoo officially shut down AltaVista in 2013. AltaVista is ranked No. 534,615 in the world, according to Alexa.